An authentic review on the South African online casino, Springbok offers Free Bonus on sign up. We give you an access to the latest offers from Springbok Casino! Launched in the year 2012, Springbok Casino is a premier choice for players looking for a fair online casino. Often regarded as one of the best mobile casinos in South Africa, Springbok Casino leaves no stone unturned to provide unmatchable gaming experience to players world wide just like its sister site – Thunderbolt Casino. Additionally, this online casino offers a blend of numerous services including a responsive customer support along withQuick and Secure payouts via alternative payment methods. A Real Time Gaming Casino, it offers more than 300+ games that include Slots, Table Games, Roulette, Poker, Scratch Cards and Jackpot Games. What's more, to enjoy these games Springbok Casino offers lucrative bonuses and promotions to boost the bankroll considerably for new and existing players alike. For starters, this online casino offers a No Deposit Bonus worth R250 which can be claimed by applying 'TEST-SPRINGBOK' as the coupon code. In line with the regulations as enforced by the Curacao GovernmentSpringbok Casino ensures to maintain a safe gaming environment for its players. To further maintain the safety and security of private player information over the internet, all the data transferred to and from this casino website is end to end encrypted via thelatest SSL technology Systems. Furthermore, RNG systems are employed to ensure the outcomes are random and fair. Players signing up from these countries will be allowed to redeem a Bonus at Springbok Casino: Swaziland, Namibia, Mozambique, South Africa and Lesotho. 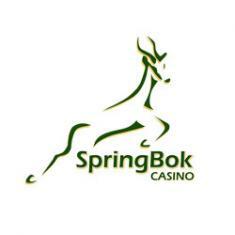 Springbok Casino services shall be restricted to players belonging to those territories where the Springbok Casino games are prohibited by law. The advancement and development in technology have brought about a huge change in the online gambling industry in terms of mobile gambling or mobile casino. Apart from the convenience, mobile casinos give the players an option to choose from an array of around 150+ table games, card games and slot games while on the go. The mobile gaming section at Springbok Casino works on the latest technology and is compatible with iPhone, iPad, Android, Blackberry or Windows mobile devices. Furthermore, the Springbok Casino makes use of HTML5 technology which facilitates the development of cross platform games across a host of devices. An exclusive app is available to download for all the Android users, whereas players with devices supported by other systems can simply use the instant play option directly from this online casino's browser site for highly responsive 'on the go' gaming. Since most of the games found at this online casino are accessible via your mobile device, you can now take the pocket casino wherever you go! games while on the go. The mobile gaming section at Springbok Casino works on the latest technology and is compatible with iPhone, iPad, Android, Blackberry or Windows mobile devices. Established in the year 1998, Real Time Gaming powers the versatile collection of games at Springbok Casino. A name synonymous with high quality games and best in class services, Real Time Gaming has been in the forefront to render some of the most effective back office solutions. RTG is also popular to provide games that support cutting edge technology and amazing visuals which certainly enhances the game play for a player. Furthermore, the Real Time Gaming software ensures to provide a user friendly interface with the same splendid features both on mobile as well as the desktop version of Springbok Casino. The software provider also makes sure to employ RNG services so that all the outcomes of its games are fair and reliable. The software can be downloaded, used via flash instant play version or a mobile casino software format. with high quality games and best in class services, Real Time Gaming has been in the forefront to render some of the most effective back office solutions. RTG is also popular to provide games that support cutting edge technology and amazing visuals which certainly enhances the game play for a player. The gaming section is the cornerstone for any online casino. Likewise, Springbok Casino houses around 300+ online slots, table and card games which can be accessed via easy to use separate sections for each game. The gaming library is majorly divided into the following headers – New Games, Progressive Games, Slots, Specialty Games, Table Games and Video Poker. So, irrespective of whether you are a Blackjack fan, a Roulette buff or a slot lover there's something for everyone at Springbok Casino's gaming section with more games continually being added to the game catalog here. What's more, all these games are also available to play for free via the demo version. Discover the amazing and extensive range of casino games as available on Springbok Casino all of which are available to play on desktop and mobile as and when you please. Undoubtedly the most popular choice for both new and existing players alike, the slot games at Springbok Casino come in all shapes and sizes. Slot games not just provide the necessary thrill but also award generous winning combinations. Accommodating distinct moods and pockets, it in fact offers you a chance to play all the slots games here for free before you pick a game. The slots line up here consists of traditional 3- reel classics or more recently added 5-reel or 6 reel slot games like – Bubble Bubble, Naughty or Nice, Cleopatra's Gold, Achilles, Aladdin's Wishes, Lucky 6 and Stardust. Furthermore,Springbok Casino offers numerous slots tournaments. Players can login to these buy – in and freerolls tournaments to win massive prizes simply by playing the online slots games available here. Widely played and loved casino games can now be played via your desktop or your phone screens all thanks to Springbok Casino. The collection of Table and Card games houses different varieties of Roulette, Blackjack and Baccarat along with video poker games. Game of skills and chance, the tables at Springbok Casino await you to render a captivating game play experience. Some of the many variants found here include – Baccarat, Suit’Em Up Blackjack, French Roulette, Face Up 21, Classic and European Blackjack, Perfect Pairs, Super 21, Match Play 21, European and American Roulette. The best part about playing video poker is that the player plays a vital part in deciding the outcome of the game. A game of strategy and skill, Video Poker is quickly becoming a hot favourite among online as well as land based players. Offering some of the best odds, the video poker games at Springbok Casino are - Aces and Eights, Bonus Deuces Wild, Mystery Bonus Poker, Bonus Poker, All American Poker, Double Bonus Poker, European Slot Poker, Jacks Or Better, Joker Poker, Double Double Bonus & Jackpot Poker, Loose Deuces, Pick 'em Poker, Sevens Wild and 7 Stud Poker. Quick thrills and a dynamic game play await you at Springbok Casino where dreams come true in a jiffy. If you're wondering what this is about, then Springbok Casino helps you realise your dream of becoming a millionaire by spinning the reels of its progressive slots! Jackpot games at this online casino are swelling up to be triggered at huge amounts and consists of games like – Ancient Gods, Megasaur, Spirit of the Inca, Caribbean Hold'em and Caribbean Stud Poker. If the above games line up did not satiate your need for multiple games, then Springbok Casino certainly won't disappoint you. The specialty games section at Springbok Casino includes variants of Scratch Cards, Keno, Board Games, Bingo Games, Shooting Games and more. All these games provide fun and excitement galore along with ample opportunities to win real money and other exciting prizes. A Free Bonus worth R250 awaits you at Springbok online casino. Sign up now and get your No Deposit Bonus by redeeming the Free Bonus Coupon Code. Springbok Casino No Deposit Bonus/Coupon Code is 'TEST-SPRINGBOK'. Redeem this Promo Code by heading to the Cashier section and a Free No Deposit Bonus of R250 will be credited instantly to your new player real money account. For all the new and existing players at Springbok Casino, there is an exclusive match deposit bonus available on redemption of the specified Bonus Promo Code and making a minimum deposit. The real money customers at Springbok Casino can redeem the Coupon Code: 'SPRINGBOK300' and make a deposit up to R200. This will yield the players an exclusive match deposit bonus of 300% up to R600. This bonus will be credited on any deposit made by the player after redeeming the given Coupon Code. Players can contact the Customer Support team at Springbok Casino to get 25% Cashback Bonus on every deposit made sans a deposit bonus used. This implies that total deposits with the player should be R12000 and for any losses incurred on these deposits, players will receive 25% Cashback Bonus up to R3000. This bonus carries 10x play – through requirements which have to be fulfilled by playing Slots, Bongo, Keno and Scratchcards. Playing for real money involves a lot of perks and one of them is the Comp Points Bonus. For every R10 bet/wager placed on the online casino games at Springbok, players will earn Comp/Loyalty Points. After accumulating 100 Comp Points, players can head to the Cashier section to redeem their earned Comp Points. At the minimum, players can redeem 100 Comp/Loyalty Points for cash credits worth R1. Please enter your review for the Springbok Casino.